HOUSTON, Texas -- Family, dignitaries and invited guests attending the funeral of former First Lady Barbara Bush today at 11:00am CST at St. Martin's Episcopal Church have been announced. The Bush family led by former President George H. W. Bush, former President and Mrs. George W. Bush, former President and Mrs. Bill Clinton, former President and Mrs. Barack Obama, and First Lady Melania Trump, along with 1,500 guests, will gather to pay respects to the much beloved matriarch known for her wit, candor and relentless advocacy for family literacy. Following the funeral service, the Bush family will proceed by motorcade to the George H. W. Bush Presidential Library in College Station, Texas for a brief, private interment ceremony. 10:00 AM	VIP Reception hosted by President George W. Bush. 10:40 AM	Grandson pallbearers gather. 12:30 PM	The remains will be carried from the church by the grandsons. 12:40 PM	Motorcade departs St. Martins Church en route College Station. Houstonians may pay their respects. publicized so that the A&M/College Station community may pay their respects. 2:45 PM	Arrive George Bush Presidential Library Center, College Station, TX. Speaking at the service are Barbara's son Jeb Bush, her personal friend Susan Baker, and author/historian Jon Meacham. The former first lady often said she preferred to have a simple service. 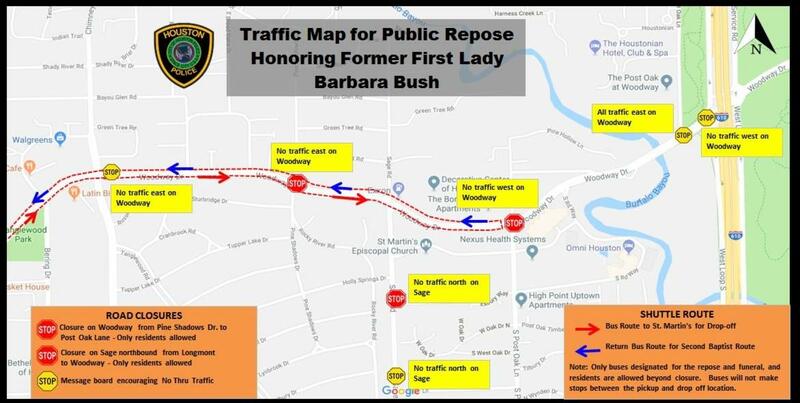 Mrs. Bush will be buried behind her husband's presidential library at Texas A&M University in a gated plot surrounded by trees and near a creek where the couple's 3-year-old daughter, Robin, is buried. She died of leukemia in 1953. Expect heavy traffic delays and plan ahead to find alternate routes. Who are George HW Bush's children and grandchildren?